What’s all the hype with Acute Flaccid Myelitis (AFM)? 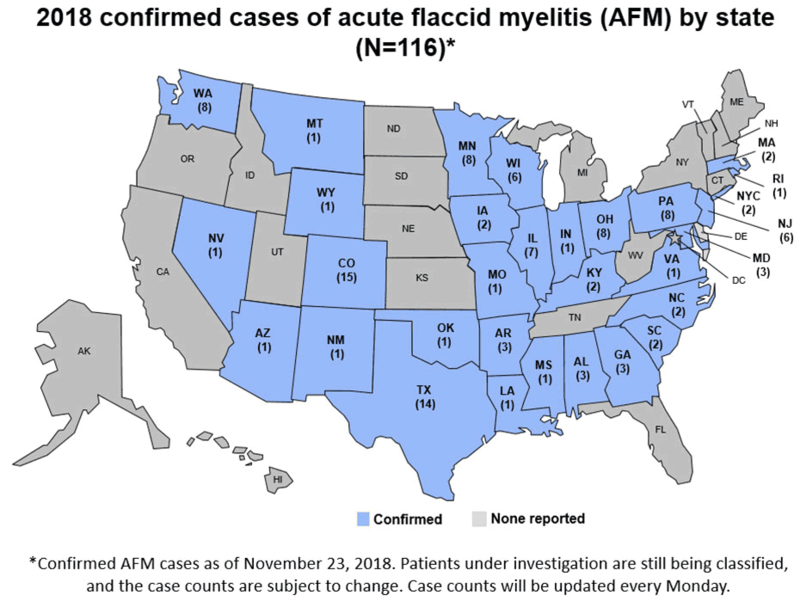 Recently, there has been a lot of local and national news coverage around a mysterious, polio-like condition affecting children across the United States called acute flaccid myelitis. As of Monday, November 26, 2018, the Centers for Disease Control and Prevention (CDC) has confirmed 116 cases across 31 states and is investigating an additional 286 cases. Acute flaccid myelitis, or AFM, is a condition that causes severe muscle weakness and loss of muscle tone in one or more parts of the body. This weakness is caused by inflammation of the spinal cord. AFM is believed to be caused mostly by viral infections which attack and damage the spinal cord. Most of these viruses are common infections that everyone eventually acquires. No one knows why these viruses affect the spinal cord in only a tiny fraction of the population. Other microorganisms, such as bacteria, can also cause AFM in some patients. AFM primarily affects children, but adult cases have been reported. Numbness or tingling is rare with AFM, although some people experience pain in their arms or legs. Some people with AFM may be unable to pass urine. The most severe symptom of AFM is respiratory failure. In very rare cases, it is possible that the process in the body that triggers AFM may also trigger other serious neurologic complications that could lead to death. AFM is diagnosed by examining a patient’s nervous system in combination with reviewing pictures of the spinal cord. AFM can be difficult to diagnose because it shares many of the same symptoms as other neurologic diseases, like transverse myelitis and Guillain-Barre syndrome. With the help of testing and examinations, clinicians can distinguish between AFM and other neurologic conditions. Certain viruses are known to cause AFM including enteroviruses such as poliovirus, enterovirus A71 (EV-A71), and West Nile virus. Since 2014, the CDC has identified that most patients with AFM had a mild respiratory illness or fever consistent with a viral infection before they developed AFM. All the stool specimens from AFM patients received by the CDC tested negative for poliovirus. 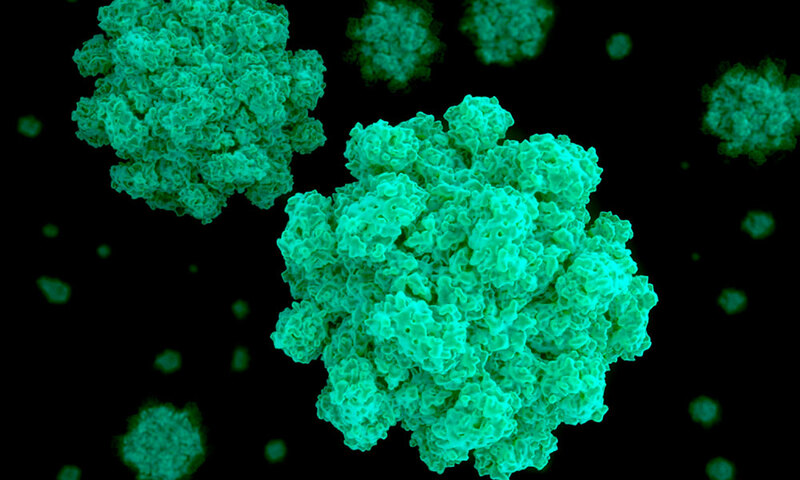 The CDC has detected coxsackievirus A16, EV-A71, and EV-D68 in the spinal fluid of four of 414 confirmed cases of AFM since 2014. For all other patients, no pathogen has been detected by the CDC in their spinal fluid to confirm a cause. This may be because the pathogen has been cleared by the body or it is hiding in tissues that make it difficult to detect. Another possible theory is that the pathogen triggers an immune response in the body that causes damage to the spinal cord. Researchers are seeking to understand what triggers AFM in a minute percentage of patients who have had a fever and/or respiratory illness. There is no specific treatment for AFM, but a neurologist may recommend certain interventions on a case-by-case basis. The CDC is working closely with experts to better understand how to treat AFM and understand the long-term prognosis. Since the exact cause of most AFM cases is unknown, there is no specific action to take to prevent AFM. The steps you can take to prevent AFM are the same steps you should take to prevent any other infection. The CDC recommends protecting yourself and others from enteroviruses by washing your hands often with soap and water, avoiding close contact with people who are sick, and cleaning and disinfecting frequently touched surfaces. Good hand hygiene is the number-one way to avoid infections of all kinds.